vGauge-32N uses a large 800 X 600 COLOR graphic sunlight readable LCD screen with touch interface and microprocessor control to allow you to monitor 16 custom gauge functions with alarms when used with the vGauge-Remote sensor box. Features Glass-On-Glass touch surface for dependable performance in marine environments. Configure up to 8 data screens using a variety of built-in digital display and graphics formats recalled with a single scroll button. You can custom design it to match your instrumentation system. Built with a rugged solid aluminum case that is triple coated to ensure a quality durable finish. vGauge-G12C uses a large 320 X 240 COLOR graphic sunlight readable LCD screen with touch interface and microprocessor control to allow you to monitor 16 custom gauge functions with alarms and data logging when used with the vGauge-Remote sensor box. vGaugeG24N uses a 8.4" diagonal daylight viewable color graphic LCD screen and microprocessor control to allow you to monitor twelve custom gauge functions with alarms and data logging when used with the vGauge-Remote sensor box. 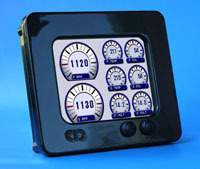 Compact module allows for custom mounting to create that unique digital dashboard with complete instrumentation. 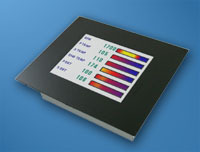 Weather-resist touch surface can be flush mounted anywhere. Comes with Windows XP and PocketPC applications for remote viewing and data logging. 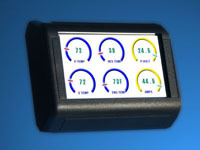 vGauge-G12Ci uses a large 320 X 240 graphic sunlight readable color LCD screen and touch control to allow you to monitor 12 custom gauge functions with alarms. Ideal for OEM replacement in single and dual outboard applications with expanded functions like engine sync and fuel flow monitoring. Strong ABS plastic case is sealed to the environment with a textured finish for easy maintenance. vGauge-G12A uses a large 320 X 240 graphic sunlight readable LCD screen and microprocessor control to allow you to monitor 16 custom gauge functions with alarms and data logging when used with the vGauge-Remote sensor box. vGauge-G12P uses a large 320 X 240 graphic sunlight readable LCD screen and microprocessor control to allow you to monitor 16 custom gauge functions with alarms and data logging when used with the vGauge-Remote sensor box. 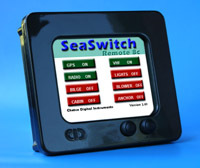 SeaGaugeG12N Module uses a 4" diagonal daylight viewable color graphic LCD screen and microprocessor control to allow you to monitor twelve custom gauge functions with alarms and data logging when used with the vGauge-Remote sensor box. 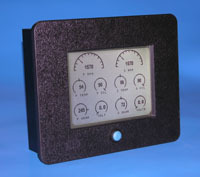 Compact module allows for custom mounting to create that unique digital dashboard with complete instrumentation. Weather-proof touch surface can flush mounted anywhere. Optional ethernet and Wi-Fi support allows switch control over any Internet connection. 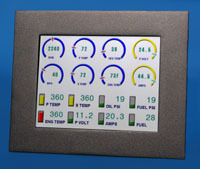 vGauge18S uses a wide 480 X 272 color touch screen and microprocessor control to allow you to monitor 16 custom gauge functions with alarms and data logging. Comes with Windows XP/Vista PC applications for remote viewing and data logging. vGauge-G12S uses a compact 320 X 240 graphic sunlight readable LCD screen and microprocessor control to allow you to monitor 16 custom gauge functions with alarms and data logging when used with the vGauge-Remote sensor box. 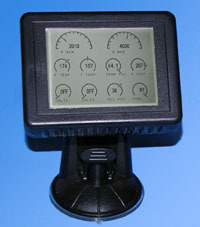 Small profile plastic case is easily mounted on windshield, dash, or console using a selection of pedestals. 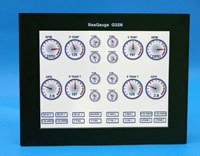 vGaugeG12 Module uses a 5.7" diagonal daylight viewable graphic LCD screen and microprocessor control to allow you to monitor twelve custom gauge functions with alarms and data logging. 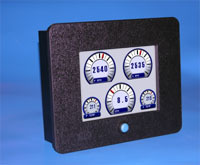 Compact module allows for custom mounting to create that unique digital dashboard with complete instrumentation. 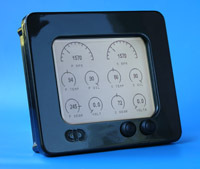 vGauge-Remote Remote Sensor box allows additional gauges to be added to any vGauge unit. It also allows all sensor wiring to completed in the engine bay and transmits data via NMEA 0183 interface to dashboard monitoring station. 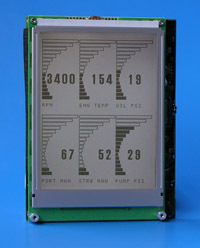 Unique sealed microprocessor design provides a stand-alone interface to PC/PDA using supplied Windows XP and PocketPC PDA software for remote data viewing and data logging. vDash allows display of information from vGauge on any Laptop or desktop PC running WINDOWS XP OS. You can even control the unit remotely. Just attach your PC to the vGauge serial port or Bluetooth wireless port and get real-time updates vDash includes the ability to capture data to your PC for later viewing. Capture rates can be set from 1 second to 30 minute intervals. Data is easily viewed in a text editor or spreadsheet application. vDash allows you to reprogram the vGauge with new Sensor Labels or Sensor calibration curves created by any text editor. Just modify the text files and download to the unit for instant updates. Ideal for fine tuning your sensor readings or adapting to your existing sensors. Ethernet to USB adapter adds a wired RJ45 interface to vGauge-Remote. Contains complete WEB server to host custom pages and JAVA applets. Allows remote access to all vGauge functions via Internet connection. Allows attachment of vGauge-Remote USB port (master) to host PC USB port (master) and extends USB cable length to over 30 feet. Converts any USB port to serial ports used on vGauge-Remote and vGauge Display heads. Supports distance up to 180 feet. Comes with two cable adapters with secure ends for attachment to all vGauge units. Add this water-resist Bluetooth module to vGauge-Remote and get wireless data interface up to 300 feet. Comes with 16 foot USB cable to allow placement for maximum reception.